Don’t let the fear tell you that it is too late to return to education, says Dr Tarynne Quirk. 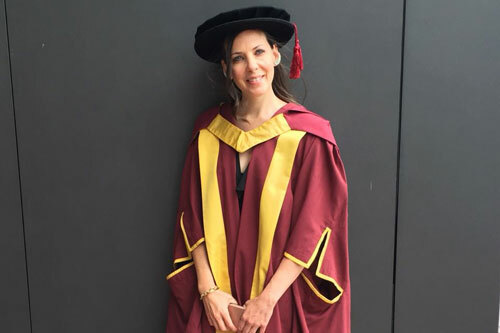 Dr Tarynne Quirk, (Professional Doctorate in Counselling Psychology, 2018), and former Web Content Officer at City, offers advice on returning to academia and why sometimes you need to address the voice in the back of your head. Dr Quirk who started working at City in 2009 before beginning her PhD in 2013, now heads to South West London St Georges Mental Health Trust, to work as a psychologist. During her PhD, Tarynne also set up her own private psychological consultancy company. “I did my psychology degree in South Africa and originally came to London on a gap year, but just fell in love with the city and decided I wanted to stay here. I entered the marketing sector out of the blue when applying for jobs in London, but my long term plan was to always go back to South Africa to further study psychology. “Things changed and instead of going home, I enrolled on a Psychology PhD here at City. Immediately my weeks became busy, I worked 2 days at City, then I was on placements in hospitals or GP surgeries for another two days and then on the fifth day I was in lectures. My evenings were also often spent seeing private clients, so time keeping became quite important! Dr Quirk admitted to feeling nervous before starting her PhD citing lack of practice as a key concern. “You feel like you’ve forgotten so much when you return to education and I think that is what holds a lot of people back. It is the fear of thinking everyone in the class will be better than you as they have just finished an MA or that your academic writing will be poor because you’re out of practice. However you pick things up quite quickly and this should never be something which holds you back. “Before anyone returns to education they should analyse everything in their life and spend a lot of time deciding whether this is the right move for them. No one wants to start something that they cannot finish, so you have to be absolutely sure that this is for you. I didn’t have children or a marriage, but if you do then that is another decision you will have to make. Sometimes you have to address the voice at the back of your head. “For me there was always a voice in the back of my head telling me that I need to return to psychology, and if you have something similar then you must address it. Whether that be letting it go due to your other responsibilities or making it happen by looking at how you can juggle your commitments. “If you have limited experience in the area you want to study then I would recommend you do a taster course in that subject. For psychology you could do a basic counselling skills course or volunteer for Child Line or Shelter, this will help you realise whether this is something for you.